This past weekend I spent a lot of time working on my sister’s house. We painted her dining room, hung some curtains, and created a new centerpiece for her breakfast room. I’m totally the best sister ever, right? At least that’s what I’ve been telling her. 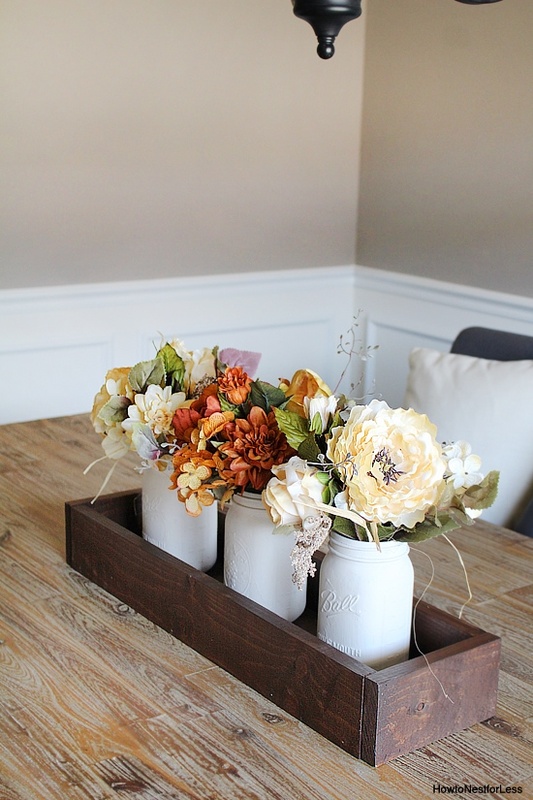 So my sister wanted something rustic for her breakfast room to match her farmhouse table (the one from my old dining room). She showed me some photos of mason jar planter boxes that she wanted to copy. 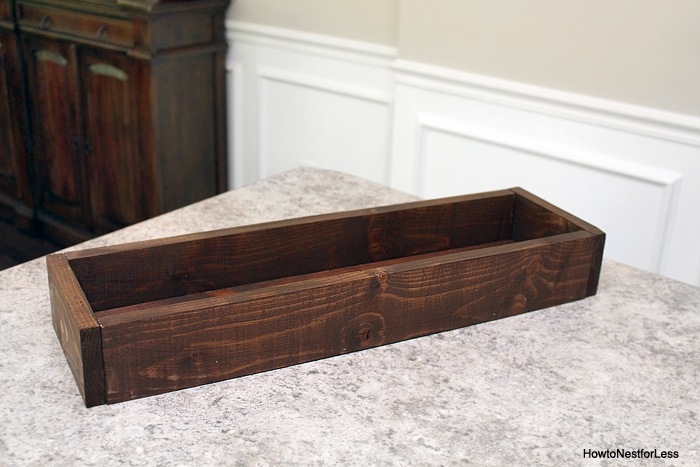 Luckily I’ve made a stenciled planter box and another painted planter box in the past so this was an easy request. 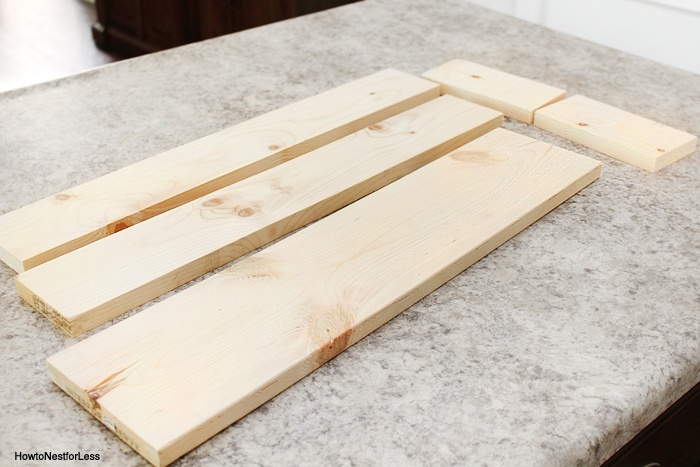 I cut the boards for the planter box: (2) 2ft 1×4 boards for the long sides, (1) 2ft 1×6 board for the bottom, and (2) 6 inch 1×4 boards for the short sides. Note: The reason I used a 1×6 board for the bottom is because the mason jars I picked out were the larger size. If I would have used a regular size mason jar I could have used all 1×4 boards. 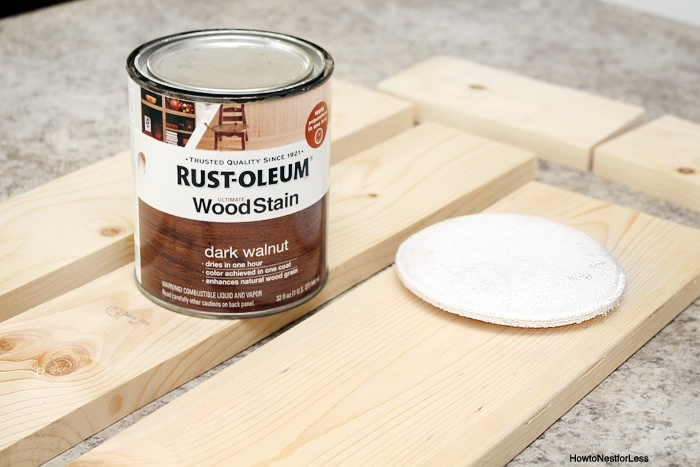 Next I stained all of the boards in the Rustoleum wood stain. This is my favorite stain because it dries in 1 hour. I just apply it with a foam brush then wipe it off with an applicator pad. Then I used my nail gun to piece everything together. 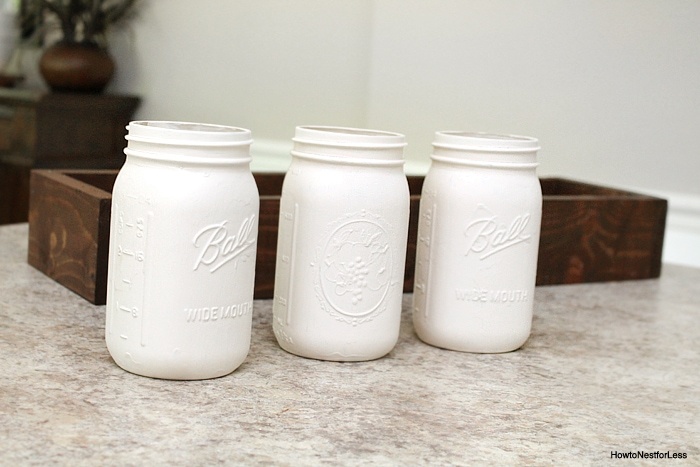 Next I painted the mason jars with some off white chalk paint. Placed some fake flowers inside and BOOM, it’s done. 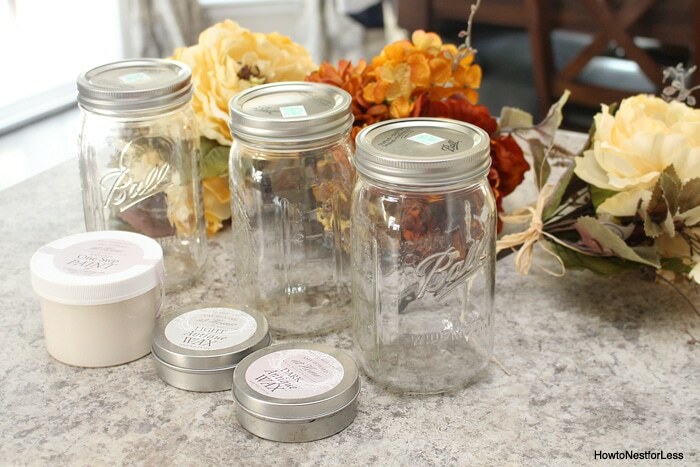 I might add 2 more mason jars down the line with a complementary color to my sister’s kitchen & breakfast room… once she decides what those are! I think a pretty olive green would look good with her blue breakfast room buffet. But for now I’m loving the look. Luckily this piece was super easy to make. The longest part was waiting for the stain to dry for 1 hour! I’ll also have to show you guys how my sister’s dining room turned out. It’s quite the transformation with the paint and curtains! We just need to find her some artwork for the walls and that room is done. Reveal coming soon, I promise! 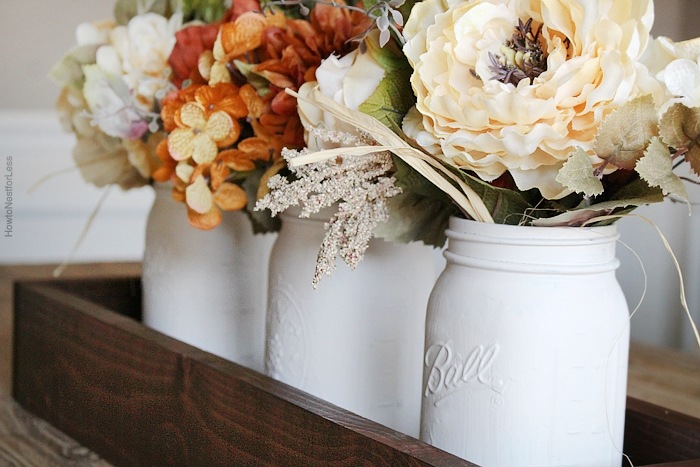 Love this – I even have the jars! Thanks for sharing. 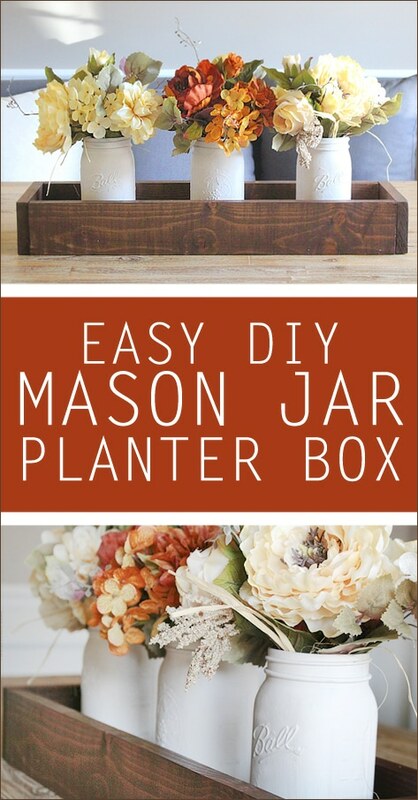 I absolutely love the jars and the planter! Just beautiful! I don’t blame you for not wanting to give it up! 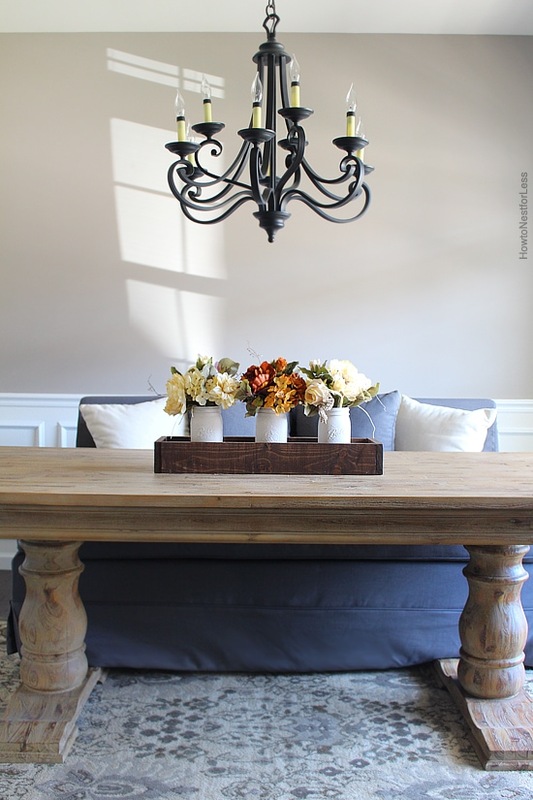 The centerpiece looks great and I love that table. Where did you get the flowers for the centerpiece? Thank you! Flowers are from Hobby Lobby! I’ve had one of these on my “want to do” list for a while – such a gorgeous decor piece! Your sister will love it. Thanks for sharing at Merry Monday! I love this!! 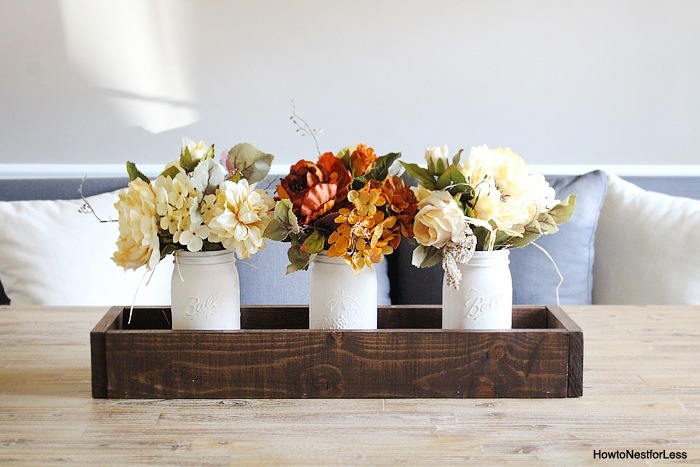 this is too cute, perfect for sprucing up the table! I’m loving these ideas. wha t kind of paint do you use to paint the jars? I used chalk paint but you can just use latex or any acrylic paints!